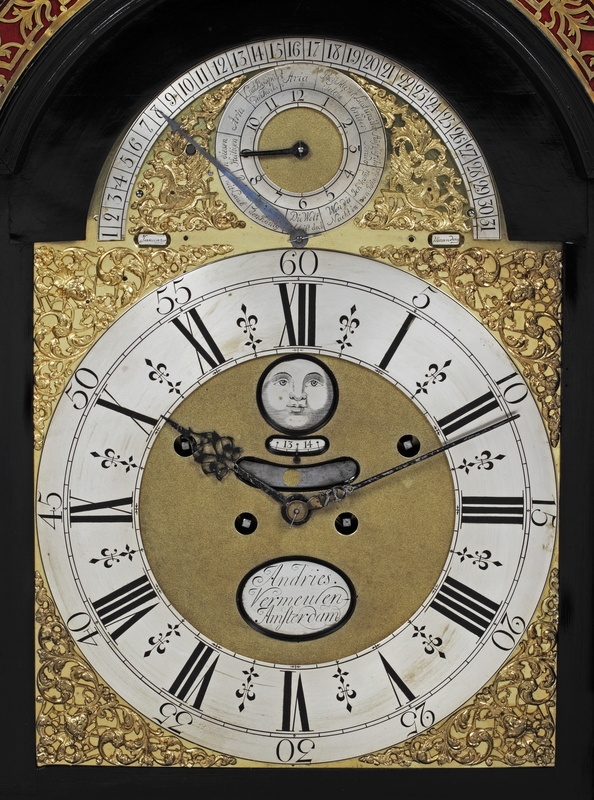 The arched brass dial has an applied silvered chapter ring with Roman numerals. The matted centre with the signature plaque Andries Vermeulen Amsterdam and apertures for the mock pendulum and moonphase with days of the moon cycle. Foliate pierced brass mask spandrels in the corners. The arch is lined with a sector for fly back date indication around the subsidiary for the tune selection flanked by pierced pegasus reliefs. Below these there are two small apertures for day of the week and month indication. The 8-day movement has four spring barrels with fusees. The going train has verge escapement and short pendulum. It strikes the hours on a bell and chimes the quarters on a nest of bells. 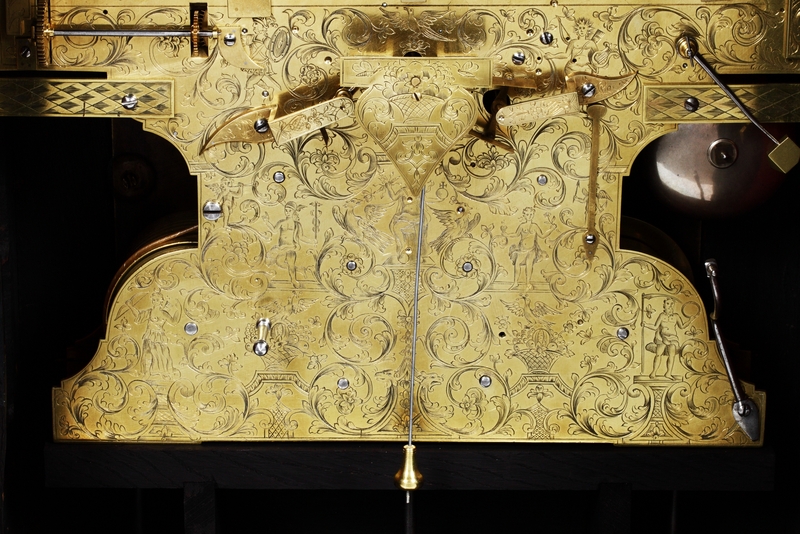 The clock plays one of twelve melodies with a pinned cylinder with 28 hammers on 13 bells. The remarkably shaped back plate has been well engraved with foliate scrolls and figures. The oak case has been veneered with ebonised fruit wood and has a very unusual shape. It is surmounted by an octagonal cresting with an ornamental urn. There are further ornamental urns on the corners. On all sides there is similar foliate pierced brass frets with very rare engraving. There are full corner columns with brass bases and capitals. The skirted brass lined base also serves as a turning table, so the clock can be turned without moving the whole. Andries Vermeulen (circa 1680 – 1752) came from Emmerich and came to Amsterdam before 1708. He is mentioned in the register of ‘Good Men’ in 1716. This was a list of masters that was comprised by the clockmakers themselves on demand of the city. 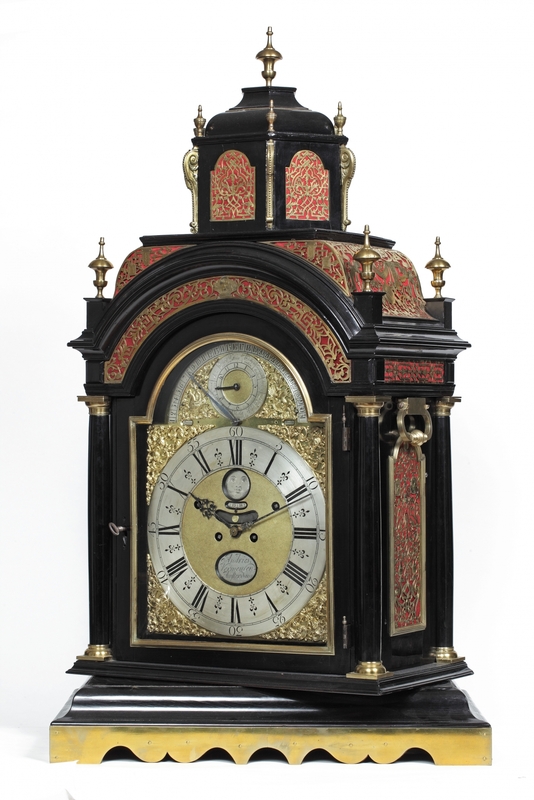 Vermeulen is regarded as the best Dutch clockmaker ever. In 1742 he is listed as the best earning craftsman in Amsterdam. 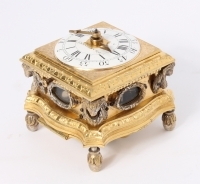 In comparison to English table clocks, Dutch table clocks are much more rare. England already had a many craftsmen specializing in making clock parts, dials etc. in the 18th Century. This meant that clocks could be produced quicker and cheaper than elsewhere. 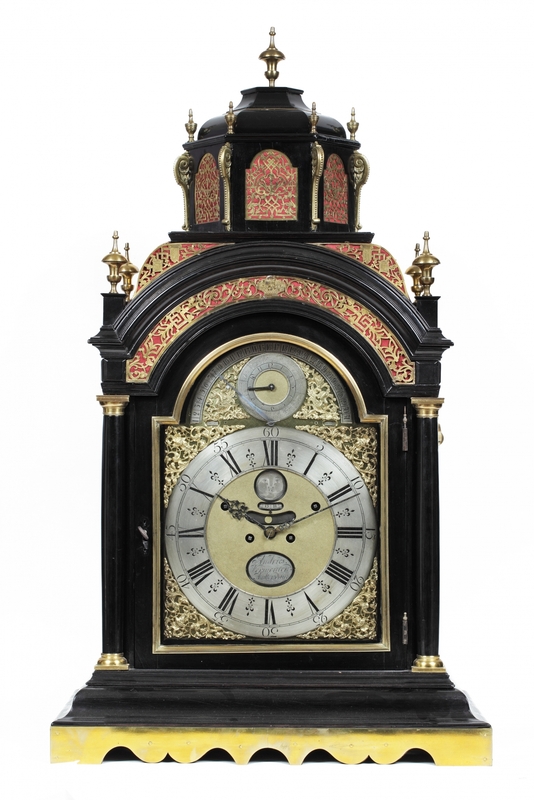 It is not uncommon, especially later in the 18th Century, that clocks made in England were sold in Holland bearing the name of the clockmaker selling them. 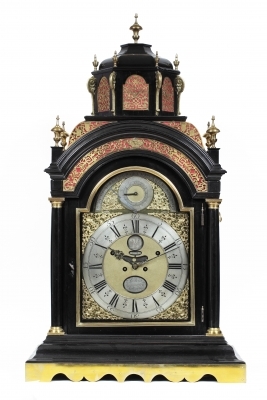 But the unusual and individual features of this clock indicate that this clock has to have been made by Vermeulen himself. The standardization of parts also meant a standardization in dimensions which lead to clocks of very similar sizes. 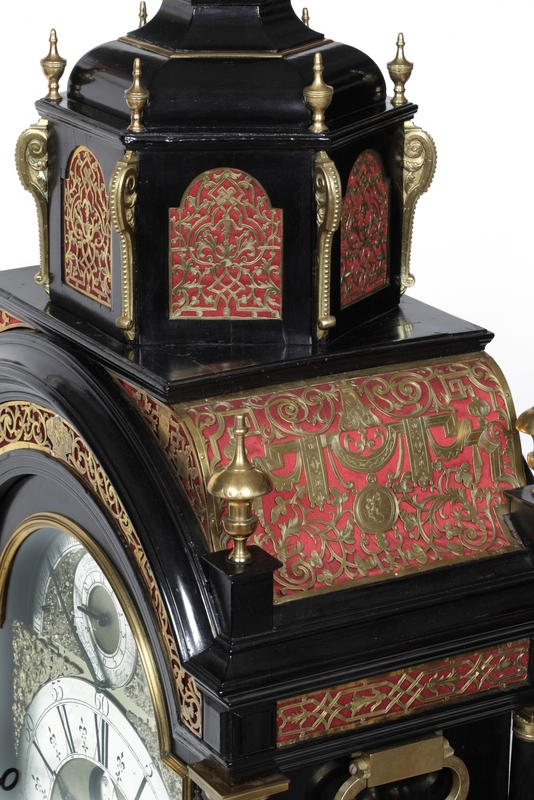 This clock with its extremely large dimensions is therefore very rare. Besides this rarity in size the movement also has very rare features. Most clocks have going and striking trains. Sometimes a clock might have an extra feature like quarter chiming or a musical mechanism. But this clock with its four trains has both quarter chiming and a musical mechanism of twelve melodies. Finally the engraving on the back plate is very elaborate and of great quality.